Remarkable and extraordinary... These are two words I can use to describe the solo piano performance of Stefano Bollani last night in Ankara. Even though I have been following him through some ECM albums, last night was the first time I have seen him live - most probably same applies to many jazz listeners in Ankara. Frankly, we -the first timers- saw very well what a great loss it is to let this experience hit us this much late. Stefano Bollani is among those enthusiastic pianists who encourage you to jump and play next to him, while he is easily travelling on the keys. It may be confidence what you feel when you see his comfortable and concentrated state of mind on the piano - and on rhodes also in this concert. Although the whole concert seemed to be improvisational and playlist-less and he barely introduced the pieces, we can say that there are many arrangements of some popular pieces as well as maestro's own compositions. Having played as a tribute to David Bowie, the performance of "Life on Mars" was among the best covers I have listened to with its groovy links and tensional changes. The overall performance was satisfactory both for listeners looking for catchy melodies and more demanding jazz followers running after complicated parts as well as energetic riffs. I felt a strong Brazilian music influence on some of the performances - and he actually played a Brazilian composition too in the concert. The moments when he used the outside and inside parts of the piano as a percussion instrument were also impressive. The first encore was like an illusion show: Stefano Bollani wanted to hear what the audience wants to listen to, regardless of the genre or chronological order. Billy Jean, My Favourite Things, Hotel California, Hit The Road Jack and Summertime were among those I have heard from the crowd. He wrote ten of them on a paper and challenged to play them as a medley. What a medley it was! There were many magic moments during the performance such as we suddenly started to listen to some reggae partitions from Stefano Bollani -also as vocals- or Billy Jean was on his left hand while Summertime was swinging on the right. The moments when Hotel California emerges above others were so groovy and breathtaking. It was beyond improvisation. He was like telling us that he can play every composition improvisationally in every form, in every style and tempo. 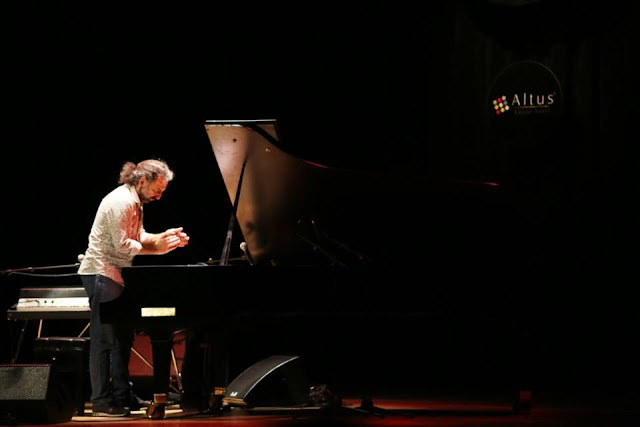 Evidently, what Stefano Bollani did last night at the performance hall of my university METU is something that Ankara audience will not forget for a long time. Considering that international jazz scene is getting less visible each day in Ankara, this concert was like a life kiss - thanks to Ankara Piano Festival run by Fırat Dadaş.